We own a separate production line of about 20 people and a sampling room of 5 people, 3 engineers and many experienced technicians. This workshop is for production for only real exotic leather goods, such as bags, shoes, belts, wallets and small accessories. Most of the exotic skins are available say crocodile skin(caiman, siam, alligator, prosus from Colombia, Singapore and Thailand etc. 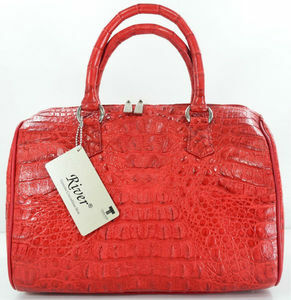 100% GENUINE RIVER BRAND HORNBACK CROCODILE SKIN HANDBAG. HANDBAG SIZE : Length = 11" Height = 9.5" Depth = 5.5" HANDLE FROM TOP OF THE HANDBAG TO TOP OF HANDLE LENGTH = 4"(INCHES. , APPOX. MATERIAL : MADE OF CROCODILE HORNBACK SKIN, INSIDE'S LINING WITH WOOLEN FABRIC. New & Genuine BROWN Crocodile Hornback Skin Leather Wallet This is a Brand New One with Authentic Grade AAA quality rare Crocodile Skin. It is suitable for your own use and also for your love one in an upcoming occasion. 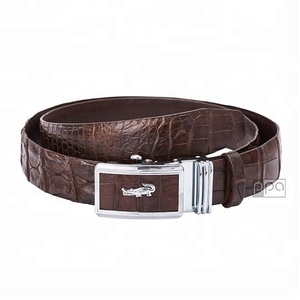 Description: The exterior is made from 100% Genuine Grade A Crocodile Skin Leather in Brown Color. Cow leather hand stitched edges. Color : Black Material : Crocodile leather. Features: Inside made from cow leather. 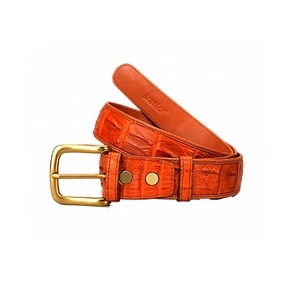 All belts are hand made from Genuine Nile Crocodile. Stitching done in genuine calf leather. Sold in minimum order quantity per colour. Genuine Crocodile Hornback Leather Unisex Tote Bag Ladies or Men. Made In Singapore. Product Photos Detailed Images Design Style This beautifully crafted genuine crocodile hornback leather tote bag will sure get the attention from people around you. It's resilient leather will retain it's shape for a long time, making it a classic collection for your unique fashion statement. Please contact us for more option on colour and design customisation +65 8168 7578 or drop us a chat message. The combination of big and small veins on the face of leather is an impressive feature of crocodile, and sometimes, we call it is natural decoration style. For these reasons, all products made of crocodile leather bring not only the sound of powering but also natural. 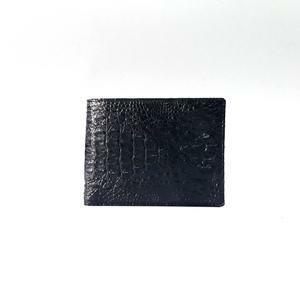 If a manufacturer uses crocodile leather for the inside of the wallet, the money may be torn due to rub money in vein. Product Details: Sizes: 22mm, 24mm, 26mm Thickness: 6mm - 3mm Material: Genuine Hornback Alligator Model: Chopper SKU: P113 Accept Payment by VISA, MasterCard, PayPal and Wire Transfer FREE Shipping by DHL Express for orders over 25 pieces! This workshop is for production only for real exotic leather goods, such as bags, shoes, belts, wallets and small accessories. Most of the exotic skins are available say crocodile skin(caiman, siam, alligator, prosus), ostrich skin (from south africa), python skin, lizard skin,stingray skin, snake skin, sharkskin, eel skin, fish skin etc. Finest material, exquisite craftsmenship, and professional expertise contributes to create premium product and unique value for respectable ladies and gentlemen all over the world. Cow leather hand stitched edges. Color : Chocolate Material : Crocodile leather. Features: Inside made from cow leather. Product Features Custom real exotic reptile elegant design ladies genuine caiman crocodile hornback skin leather handbag tote bag Art. No. Besides the 1200 sqm workshop for leather handbags, we own a separate workshop for production only of real exotic reptile leather goods, such as bags, belts, wallets and small accessories. With finest material, premium quality and Competitive pricing, we enjoy good cooperation relationship with many designer brands or private brands overseas. We also produce a lot of luxury real exotic skin mobile phone cases, key holders and small accessories etc. High quality genuine leather resources are also available, including leather imported from Italy, Singapore, Spain, and Korea. Custom packaging is also available if order qty is large enough or if only you are willing to pay for a little more extra cost. 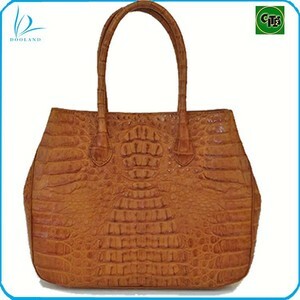 Alibaba.com offers 157 crocodile hornback products. About 29% of these are handbags, 6% are genuine leather belts, and 5% are wallets. A wide variety of crocodile hornback options are available to you, such as paid samples. 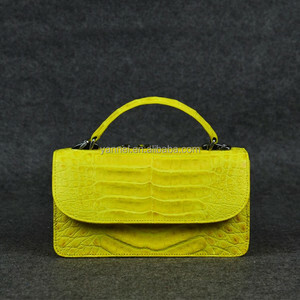 There are 73 crocodile hornback suppliers, mainly located in Asia. The top supplying countries are China (Mainland), Vietnam, and Thailand, which supply 84%, 5%, and 2% of crocodile hornback respectively. 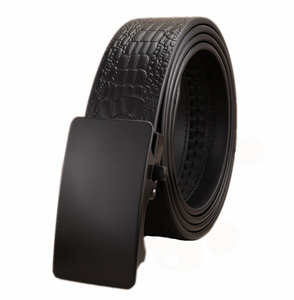 Crocodile hornback products are most popular in Southern Europe, North America, and Western Europe. You can ensure product safety by selecting from certified suppliers, including 78 with Other certification.